As 1967 turned into 1968, the Grateful Dead were at a crossroads. Sessions for what would become their second Warner Bros. LP, Anthem of the Sun, had stalled. Despite several weeks in various studios in Los Angeles and New York, from September through December, the group had completed no acceptable basic tracks, and by year's end their producer, Dave Hassinger, had left the project in disgust. This prompted Warners V.P. Joe Smith--who had signed the band--to fire off a letter to GD manager Danny Rifkin decrying the group's "lack of professionalism" and warning that their "inability to take care of business when it's time to do so would lead us to believe that they never will be truly important." Whatever. With hassinger out of the way, the group came up with a bold concept: "What if we took a 4-track on the road with us for our January-February '68 concerts, recorded all the shows, and then intercut parts of live performances with the studio takes we already have in the can? We can produce it ourselves!" Okay, so no one had ever attempted such a thing before. And there was nothing to suggest that the Dead could even pull it off. But deep down--stern admonitions to the contrary--Joe Smith evidently believed in this group of crazies, because he authorized the plan, or at the very least allowed them to proceed at their own pace in their own way, blissfully ignorant of the specifics. So, come the third week of January, when the Grateful Dead and Quicksilver Messenger Service traveled north to Eureka (in far northern California), Seattle, Portland, Eugene and Ashland for what was variously dubbed the "Tour of the Great Pacific Northwest" and "The Quick and The Dead" (after a June '66 Avalon Ballroom poster by Wes Wilson), they carried recording gear with them. Each night onstage, the Dead were both exploring and honing their new material, which included such fanciful creations as "Dark Star," "That's It for the Other One," "China Cat Sunflower," "Alligator," "New Potato Caboose" and "Born Cross-Eyed"--complex and ambitious songs that were light years ahead of the originals the group had penned back in '66. Not only did they show off the group's new compositional and rhythmic sophistication (the latter helped by the addition in September '67 of second drummer Mickey Hart), but the countless hours of rehearsal the new sextet put in to mastering the material allowed them to combine their songs in interesting and unprecedented ways: In a way it's the birth of the mature Grateful Dead sound. One afternoon while the Dead were on tour in the Northwest, Bob Weir was seized by a notion: "I was up in Oregon and fumbling with verses for 'The Other One,' which I was working on at the time, and I was trying to come up with verses that fit the music better," he recalled in a January, 2009 interview. "The first verse felt finished--the 'Spanish Lady' verse--but I wasn't happy with the second verse. Anyway, I was alone in my hotel room with a guitar, thinking about things, just kind of drifting, I think, and a new second verse came to me--it just came out and I wrote it down, and I could tell it was right." Unbeknownst to Bob, the very day he wrote the new verse, Neal Cassady died outside of San Miguel de Allende, Mexico, collapsing as he walked along some railroad tracks. The news didn't reach the Dead until they got back to the Bay Area a day or two later, but as Bob noted with typical understatement, "Obviously there was some amount of synchronicity there. And if you know anything about Neal, that's what he was all about." Indeed. Most Dead Heads are steeped in Cassady lore. They've heard the tales of his legendary feats behind the wheel--moving through traffic jams easily, seemingly oblivious to other drivers, intuiting his way around blind corners at high speeds. And of his uncanny ability to carry on multiple conversations with different people at the same time, and over days, weeks and months, without ever missing a beat, while simultaneously rapping about god-knows-what and offering commentary about whatever else might be happening in the room, or the car or on the radio. "I've tried many times to describe Neal to people, and what it was like to be with him," Bob said, "and it's very hard to do without making him sound crazy. He was quite a guy; an oracle of a very real sort. An oracle will deliver different messages depending on the time and the subject, and he certainly did that. He was the guy who was the most completely in-the-moment of anyone I've ever met. He was connected to stuff that the rest of us clearly were not connected to. It was amazing to be around." I asked Bob to conjure one more fond Cassady memory for us: "One time, when we were living at [Rancho] Olompali [spring 1966] and he was staying with us, I was in the kitchen and I heard this thumping on the wall, so I went outside to see what it was. There was a pile of rocks out there and Neal was standing about 60 feet away from the wall of the house throwing rocks at it. And he was muttering under his breath the whole time--kind of like Popeye--going on and on. And I got a little closer to him and it turned out it was all baseball stuff. He'd take a long look at the wall, shake off a couple of signs from the catcher that he was seeing that I wasn't, and then he'd throw another rock at the wall. He was talking about batters and kind of narrating the game. I watched this for a little while and then went back inside, and at some point I turned on the TV and it turns out he was talking about the game that was going on that day. I don't think he even knew it was on the TV; it was like he was living the same moment as the pitchers on the mound in the game that was on TV. It was like he was there. I think he had the score right and everything. It was incredible, but then, I wasn't really surprised by this, either." Back to early '68. In mid-January, before the Northwest trek, the Dead had played a gig with Quicksilver at a new venue in downtown San Francisco called the Carousel Ballroom. Well, "new" to rock 'n' roll anyway. Actually the place had a history dating back to the late '20s, when it was knows as the El Patio Ballroom. It had hosted a zillion Big Band dances and jazz shows through the years, but in more recent times it had been bought by an Irishman named Bill Fuller, who was something of a ballroom czar, with dancehalls in other American cities, in Europe and even Australia. He's the one who changed the El Patio name to the Carousel in the early '60s. By the mid-'60s, though, the ballroom was largely dark except for Thursday night Irish dances, so the Dublin-based Fuller and his San Francisco representative were psyched when they were approached by people representing the Dead, Jefferson Airplane and Quicksilver to rent out the Carousel. 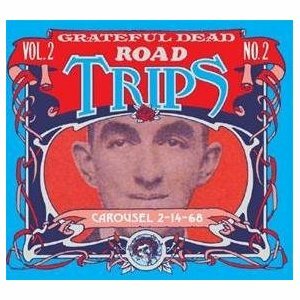 At any rate, with great fanfare, this semi-organized hippie business known as Headstone Productions put on a big 1968 Valentine's Day bash at the Carousel featuring the Dead (in their first show since the tour) and Country Joe & the Fish. The concert was carried live on a couple of local FM radio stations--the first stereo simulcast of its kind. The radioland audience was unquestionably the largest the Dead had ever played for in their brief history, and this was one of those nights when the group really rose to the occasion and just killed. Phil Lesh once ranked this as his favorite Dead show ever; this far down the line was won't hold him to that evaluation, but as you'll hear, the Dead were definitely at the top of their game, cruising confidently through their new songs and old favorites over the course of two adventurous sets. In fact, the second set offers the same selection and sequence of songs that would appear on Anthem of the Sun later that year. Not only that, but portions of this very concert would be used in conjunction with other live tapes from the Northwest tour, and from a handful of shows that followed this one, and from the months of studio sessions, to eventually create the hallucinogenic collage that the album is. Garcia dedicates that second set to "the memory of Neal Cassady," and Weir adds, "In particular, this song," moments before they launch into "That's It for the Other One," featuring for the first time ever, the verse in "The Other One" section about Cowboy Neal. No wonder the whole night is just electric. Those of you who may know this epic show from the soundboard tapes that have circulated through the years are in for a treat: Aside from some rough mixes made years ago, this marks the first time the entire show has been mixed down completely from the 8-tracks--the redoubtable engineer Jeffrey Norman strikes again! (There are a few spots where the 8-track was not available, so the best available stereo source was used.) Another cool surprise is the "filler" tracks: These were recently discovered among some long-missing reels that surfaced from the studio where Anthem of the Sun was mixed 40 years ago. There were only fragments of the early '68 shows--a few songs here and there--but there's some hot stuff, you'll hear. So, enjoy this fantastically exciting snapshot of the band at a time when they were discovering their true powers for the first time. Nights like this changed them--and anyone who was lucky enough to be there--forever.